I did not come here tonight to gloat. I came here to congratulate Jeff and Dan on their victories, although I will admit that seeing them seated at the Trustees’ table makes me very happy, and the knowledge that I and the Part-Time Faculty Association played a role in getting them there makes me happier still. And I also want to state, for the record, that neither I nor the PFA got involved in this election out of any personal malice for either Mr. Bennett or Mr. Jones. They are both nice people, and I admire them for that. But our group is facing some daunting challenges, challenges that nice guys are not going to help us solve. Relations between us and the administration are at an all-time low. The president of the college doesn’t speak to us. The administration allowed its attorney to file a brief in which she asserted that our collective bargaining agreement, put together over many years of tough and stressful effort, is not worth the paper it’s written on. Far too many administrators still regard us simply as cogs in a wheel, to be used when needed and then cast aside when needed no longer. As a college president on the East Coast said recently, “Adjunct instructors are like fine wine at discount prices.” I fear there is still some of that attitude within the administration here. For challenges like these and so many others, we at the PFA realized we need fighters. We need advocates. So we found two fighters, we found two advocates. And we did everything we could to get them elected, and the fact that they are here tonight listening to me is very gratifying indeed. So welcome and congratulations to Dan and Jeff, congratulations on your victories against some very heavy odds. What we achieved was no small thing. We are thrilled to have you here. And congratulations to Hilda, who is now so popular no one even dares run against her. We hope that your victories usher in a new era of cooperation and understanding between the PFA and the district, for we want to see relations improve. Nothing is gained, no one is helped, by this continuing hostility. But our desire for better relations does not in any way change our determination to keep fighting for justice. For that is what the issue of part-time faculty is about: Justice. At heart, the struggle of the PFA is a moral one. It is simply wrong to continue, year after year, decade after decade, asking people to provide the same level of teaching and service that the full time provides but to do it for just a little over half the pay, no benefits, no offices, little if any recognition and an attitude on the part of some that we are a second-class citizens. But nowhere on the student’s transcript does it say, ‘this class was taught by a part-time instructor, therefore the credits you see are only worth half of those earned from a full time teacher.” When we go into the classroom or the library or the counseling office the students we teach or serve don’t know if we are full or part time. They have a right to expect the same quality of teaching or counseling no matter where they are on our campus, and I can confidently speak for the PFA and say, We provide that to them, because we are as committed to education and to serving our students as anyone else. 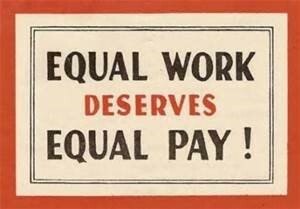 Equal pay for equal work is our battle cry, parity with full time is our goal, and justice is our aim. So when you hear how terrible the part-timer’s demands are, how they are asking for the moon and the planets and the stars thrown into the bargain, please remember that we have heard all that before. When we asked for office hours we were told we were being unreasonable. When we fought for seniority rights we were told we were creating an administrative nightmare. When we pushed to have the state parity funds put on the salary schedule we were told that the governor might take this money out of the state budget and if he did, horror of horrors, the college would have to make up the difference and shell out a little more money for the part time faculty, something it was definitely not in favor of doing. Years have passed. None of these calamities have happened. The sky hasn’t fallen, the college hasn’t gone bankrupt, we are all still here. When I travel about the state, attending conferences or conventions, I am very proud of the fact that people often tell me how much they admire our collective bargaining agreement. What makes me even prouder is when people tell me they are going to use our language in their own contract negotiations. We are setting the standard for part-time faculty units like ours, and it is my deepest wish that you be part of that, that you too can share the pride in what we have achieved. So I say now, we have an opportunity to make that happen. Let’s make Allan Hancock the first community college in California to achieve full parity for its part-time academic workers. Let’s do it together. I know we can if we try. Thank you, welcome Jeff and Dan, and God bless us all.